In the Introduction and Part 1 of this 2 part blog series, we looked at the platform and prerequisites needed to develop an iPad using Netweaver Gateway as your data provider. In this part, we will step through the app itself and look at the System Development Life Cycle (SDLC), and some of the common points when dealing with each stage. In this case the 5 steps simply outline the general direction needed to take a app from conception to production. From a requirements point of view and as mentioned in the introduction, the app was built to provide a framework for the participants and encourage them to “Extend” it. When starting the app it makes an initial service call from BAPI_CUSTOMER_GETLIST, selecting one of the records will make a second call usig BAPI_CUSTOMER_GETDETAIL and populate the detail page. Another suggestion I made was to proof out the data access portion first, not necessarily build from the bottom up, but rather ensure that all data fields which are required are accessible. I have spent countless hours developing front end apps, with a “wishlist” of datasets which were not feasible when I started modelling the data services and had to reconsider many points. Once the service has been created and exposed, RESTClient for firefox is a great tool for testing the service before even touching any code. This to me is part of the “data access” test I do before design. Executing our service in this case produced the results showing a list of the customer details. Data has been exposed and seems to be working. Next up design the app UI. 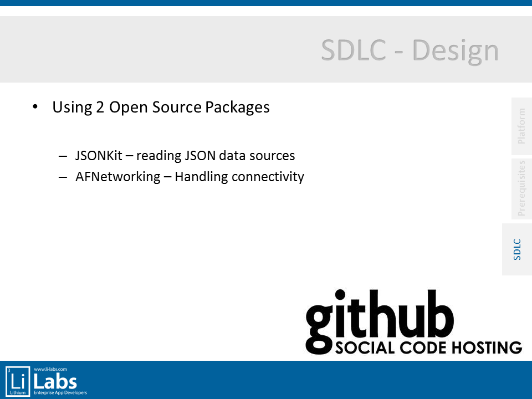 I also suggested that open source software should be considered when developing mobile apps, in our case the app will be using 2 packages to make life simpler, JSONKit and AFNetworking. Cocoacontrols.com is a great website for discovering open source code. At this stage the data source created, the UI designed and its time to do some coding in XCode. I will be going into more detail behind these steps in an upcoming blog series called “S2F”. Start with a master – detail template (from XCode). Add your UI elements comprising of labels and buttons. Create a 20 line method for fetching data from your gateway service and displaying it on the screen. Very quick and simple. Obviously *good* programming takes considerably more time, but as a POC and starting point, this is perfect. Data, design and code done, next up some testing and deployment options. We did a quick test and spoke about the deployment options. If you are a partner and would like to certify your app, work needs to be done to package your content using the AAK toolkit and developing in your own namespace. I see you are passing the username and password in the URL? Yes, in this example that was the case to display the simplicity. Pratically you would want to definitively use SSL, pass your params in the header of the HTTP request and also possible hash/encrypt these variables. Why did you use a native app versus HTML5? This is another blog post all together, but essentially my argument is it depends on the job at hand and what is trying to be accomplished. A bit like a decision of when do you add a web page to your portal versus developing windows form app, there is no simple or straight – once size fits all answer. Both have their place.